At this time, MADACC has both an in-house and foster-based adoption program which focuses on the placement of unclaimed stray animals. We have two ways to adopt animals at MADACC. You must come to MADACC in person to meet adoptable animals! We do not have the resources to give information about adoptable animals over the phone and callers will be instructed to come to the facility. Pre-Select (PS) dog adoptions are available through our new process of making certain dogs available for adoption prior to the stray hold expiring. Not all animals will qualify for Pre-Selection (those with known owners, those with medical and behavioral challenges, and other variables). You will be able to meet with these dogs and if we make a match we will set up an adoption. If an owner comes to reclaim, we will return the dog to it’s family and void that adoption. If no owner comes to reclaim, we will have the animal made ready for adoption and able to have their new family pick up at the earliest date available after the stray hold expires. You can find Pre-Select Animals by going to our Dogs at MADACC page, and looking for a PS in the ID field. The status of animals can change daily pending medical exams so if you are interested in an animal you can check back. Only animals identified with a PS are available for the Pre-Select program. Please note that until an animal has been sterilized and vetted for adoption that the owner of that animal may come in and reclaim that animal. MADACC respects property ownership claims even if it is days after the stray hold has ended and the owner has paid the required fees. This is not a common situation but we want to be clear up front about this potential situation. Dogs with an asterisk (*) in front of their name are off stray hold and available for adoption at MADACC. Dogs and cats that have not been reclaimed are also available to meet and bring home at our building seven days per week. Our adoptable cats are always viewable in our lobby. Our adoption center staff will happily help you select the right dog to add to your family. We strongly encourage you to come into our facility to meet animals in person and not wait for animals to be updated on our Petfinder page. That page is not able to always be updated in a timely way and you could miss out on an animal you could be interested in if you do not come in person. Please be advised that we will not hold an animal for you to go home and get other family members or companions. Another potential adopter would be able to see and adopt an animal that you might be interested in while going to get other family members. Make sure when you come that you can make a decision on adoption, or have the authority to make that decision for your family. MADACC will send you an email or give you a phone call once your application is approved! Fill out an online adoption application! Click HERE! ¡Complete una solicitud de adopción en línea! ¡Haga clic aquí! Click here to view our adoptable animals! This is the Petfinder Page. Click here to view Pre-Select dogs on Stray Hold! This is our PetHarbor Page. If you are interested in adopting an animal from MADACC please contact us and submit an application. Other animals on our website will be transferred to area shelters and rescue partners for adoption. If you find an animal and bring it in to MADACC, and are interested in adopting the animal if it is not reclaimed by an owner, please fill out an application while at our facility and you will have priority adoption status for that animal. Please note that finders will still need to go through the same approval process as any other potential adopter. 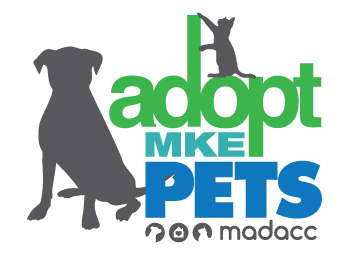 To assist further in the placement of adoptable animals, cooperative efforts exist between MADACC and Milwaukee area humane societies, regional breed rescue groups, and wildlife sanctuary centers. All adoptable or potentially adoptable animals that have completed their stray hold period and were not claimed by their owner are offered to our animal placement partners.